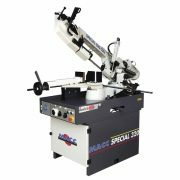 Buy a metal cutting bandsaw for a great price from MACC. 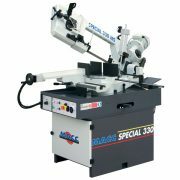 We have a very wide range of heavy-duty and high-quality industrial bandsaws for cutting all types of metal and steel. We specialise in supplying large industrial bandsaw models that deliver the highest quality cuts and meet the high standards demanded by the industry. 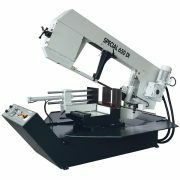 As metal cutting saw specialists, we have been supplying bandsaws to industrial workshops all across Australia for over 20 years. Our experience and expertise has helped us to develop Australia’s best range of metal cutting saws and allows us to deliver the best service and advice to our customers. 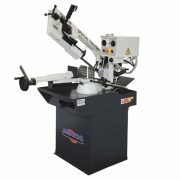 All bandsaws can also be delivered to New Zealand, South East Asia and the South Pacific. 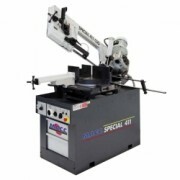 Bandsaws are considered to be capacity-type cutting machines, making them great for large volumes of work. Featuring a horizontal blade, the cut quality is good on bandsaws, however, do keep in mind that burr does tend to be left on the edges. The blades on bandsaws are also disposable, so you can throw away an old and blunt blade and replace it with a new one with zero hassle. 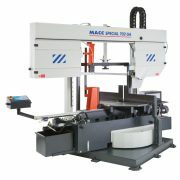 We are the sole Australian distributors for MACC bandsaws. With over 35 years in the saw manufacturing industry, MACC is internationally renowned for its superior quality and innovative product range. All MACC saws are reliable, heavy duty machines manufactured in Italy to the highest quality. We have a very wide range of medium sized saws 7″, 9″ 10″ and 11″ which are well suited to the steel fabrication industry. The range also includes machines up to 18″, manual machines, semi-automatic as well as full automatic CNC bandsaws. The MACC range includes 25 different models stocked in Australia, ready to be distributed across the country and internationally. 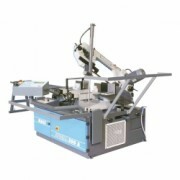 Manual bandsaws require the operator to perform many of the cutting processes manually such as advancing the material through the cut and clamping the material into the vice. The pull handle can be used with a trigger mechanism or the hydraulic descent cylinder can be set to perform the cut in manual bandsaw models. 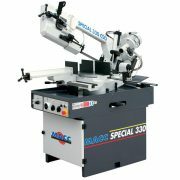 In our manual bandsaw range, we have impressive cutting machines that are suitable for both general use and industrial purposes. All of our manual bandsaw models feature a trigger switch with manual downfeed for small quick cuts, dual modes, an adjustable material stop for repetitive production, an incorporated recirculating coolant system, and a two-way swivel head. Whether you choose the Special 301CSO-3P model with a 1.5HP three phase motor and 230mm cutting capacity to the Special 411CSO with a 2HP three phase motor and 300mm cutting capacity, you can expect the same, high-level Italian-made quality you always get with MACC. 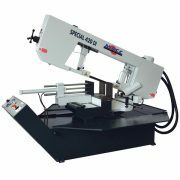 Semi-automatic bandsaws are an ideal option if you want highly accurate cuts as fast and efficiently as possible while also being safe. These machines automate all the essential elements of the cutting process to make work easier. Once the desired feed rate and blade speed are set and the material to be cut is placed on the cut point, your semi-automatic bandsaw can do the rest. The only model that does not follow this process is the Special 702 GA which had the added feature of automatically swivelling the saw to set the angle after the start button is pressed. This model also has the largest cutting capacity at 550mm while other semi-automatic models have peak cutting capacity between 260mm and 460mm. We even have a fully automatic CNC controlled machine available giving you complete hands-off, digital control of quality and cut length. Our 11” Fully Automatic Swivel Head Bandsaw lets you set and forget, allowing your workers to get on with other jobs while the machine does the cutting for you. Optional configurations can also be added to this model including a fully guarded version for extra safety, as well as a single or double vertical vise for bundle cutting. 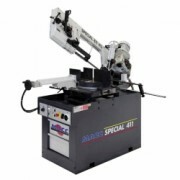 This is the best machine you will find for high capacity metal cutting work. Understanding the benefits of each bandsaw option is no simple task, which is why we are here to help. We want to make sure you order the correct bandsaw machines with the right set of features and benefits for your desired applications. Give us a call on (07) 3287 1114 or send us an email at sales@industrialtool.com.au to make an enquiry and to receive advice and recommendations from our experienced team.